It’s been a month since we welcomed the new year and February only reminds us how fast time flies. Have you accomplished any of your new year’s resolution yet? The fact is fast-moving time is wasted time. You probably have more idle times than productive ones. It’s time to change. To compensate on your idle moments with more productive activity, here are the best puzzle games you can play on Android to keep your brain working. The Room is one of the widely celebrated puzzle games on Android that feature three entries of endless hours solving puzzles. The controls are simple. You only need to swipe and double tap as you uncover the story behind the mystery. Each game is long and will give you many hours of playtime. The latest version of this game is The Room: Old Sins. The story revolves around a nerve-chilling dollhouse in an attic. Using a mysterious eyepiece, you must inspect the dollhouse and uncover its secrets that will lead to solving the mysterious disappearance of the house’s owners. Love physics? Bridge Construction Portal might be the right game for you. This physics-based puzzle game provides a good challenge, fun, and a wacky element. The player will be driving test vehicles that need to go through 60 test chambers. The test vehicles must reach the end of every course using portals, propulsion, and repulsion gels while avoiding deadly lasers, acid pits, and turrets at the same time. Two Dots is a sequel to the wildly popular Dots game. Thus, the name. It is one of the best puzzle games on Android that is simple to learn, difficult to master, and surprisingly highly addictive. The goal of the game remains the same as its ancestor. You must connect as many dots of the same color as you can. The only difference is more skills have been added and over 900 levels to complete. The first 10 levels are tutorial stages. The difficulty increases as you progress through the game. 900+ levels should be enough to kill your idle time this 2019. Fact: Minimalist games are highly addictive. This minimalist, mind-bending, perspective-based puzzle game called hocus will surely give you endless hours of game time. There are over 100 official puzzles to solve. You can even play other user-created puzzles or create your own puzzles to challenge other players. The game will only require you to swipe to move a cube around random shapes. The goal is to deliver the cube to the red finish marker as fast as you can. As simple as it sounds, it is honestly challenging to master. GO puzzles have different franchises on Android. Ever GO puzzle has almost similar puzzle format but adaptive to its theme. Some of the most popular GO puzzle franchise are Hitman GO, Lara Croft GO, and Deus Ex GO. Every version has its unique gameplay. For instance, Lara Croft GO will put you in a puzzle filled with booby traps and Hitman GO will let you play as Agent 47 and complete each puzzle by killing marked targets. So, if you’re done with one franchise, you can immediately download another one and enjoy another brain-challenging level. Don’t let your time go wasted. 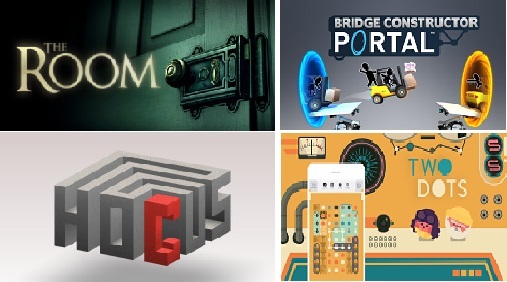 Download these puzzle games now and give your brain the work out it deserves.